A defence spokesman said, based on inputs by Naval P8I aircraft, INS Kalpeni was sent to Sesostris Bank/Bassas de Pedro - a traditional fishing area off Lakshadweep Island. 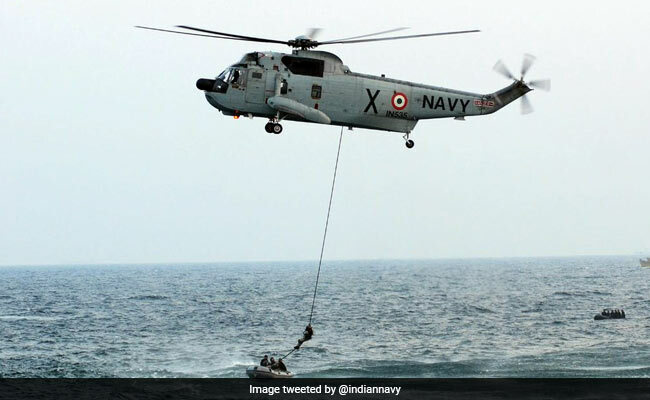 Kochi: An Indian Navy ship engaged in search and rescue operations in the aftermath of Cyclone Ockhi today located about 17 boats with over 180 people off Lakshadweep coast. However, it was not clear whether the 180 people included the 100 fishermen who are still missing after the cyclone. "She has located about 17 boats with more than 180 people. All these boats reported to be safe," he said. He said the people in the boats intended to continue fishing as they have not encountered the cyclone at all. The spokesman said normalcy is being restored on a war-footing at Minicoy island, with the Naval contingent working 24X7. In addition, a relief camp was established to distribute relief materials ferried by naval ships to all 11 villages through their 'Moopans' (village heads) as requested by the Lakshadweep administration. Other maintenance activities such as clearing fallen trees, cleaning the premises of jetty area, Navodaya School, relief camp and fisheries department are being undertaken by Naval personnel present there, the spokesman added.